According to a Southeast Farm Press article, as soybean crop planting has been delayed across most of the southeast this spring, there is a concern that Tropical Storm Andrea could move Asian soybean rust spores from the south to the north earlier than in past years. If untreated, Asian soybean rust is capable of causing defoliation and significant yield loss. Soybean producers in the southeast are urged to check their crops for disease following the storm for unusual buildups of disease and insect pests. The first symptoms of Asian soybean rust are typically small, gray spots on the bottom of leaves and alongside leaf veins. Over time, the spots increase in size, and often change color from gray, to tan, reddish-brown or black. 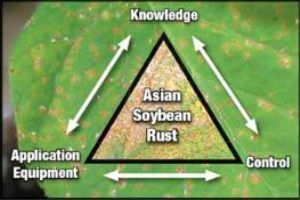 Tropical Storm Andrea’s strong winds and rain could move Asian soybean rust from the south to north faster than usual according to the Southeast Farm Press. Soybean producers should be on alert for early symptoms of the disease to prevent defoliation and significant yield loss.